The Pioneer is one of those books which you end thinking, “what is going to happen next!” It’s a book that makes you need book two, you just have only one year left to wait. But it’s going to be worth it, because The Pioneer is phenomenal. The Pioneer starts off right in the middle of the action, firmly telling us readers that in space, the consequences are so much higher. Dealing with her grief, but also her change in status, everything has changed for Jo. But it doesn’t matter now that they’re on their new home, right? But soon Jo figures out that there are secrets being hidden from them, secrets that could destroy their new glittering planet, and deadly secrets that others may die to protect. What I loved about The Pioneer was how swept away I was. I needed to finish reading, that’s all I really did until I finished it. Normally I can take a break from a book, write some reviews, but not this one. The Pioneer demanded my time. Because the stakes in this book are epic. It’s not just our individual choices, it’s the fate of the planet – the human species. 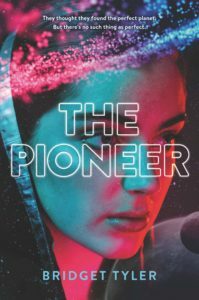 The Pioneer revolves around Jo figuring out who she wants to be, because when you think you’ve lost everything, it gives you a chance to start again. Sure there’s baggage, resentment, and new relationships, but it allows you an outsider perspective on your own situation. She’s full of a deep sadness, a longing for the way things used to be, but what Jo comes to realize is that it just might be time for her to be the hero. Tyler delivers a gripping book full of secrets, mysteries, and ethical dilemmas. What exactly are we willing to sacrifice for our friends, our family, our planet, or the human species? We can draw lines in the sand all day, but at the end of the day, are we willing to throw aside our principles and promises? Can we forgive ourselves, other’s mistakes, and lies from those we trust? There’s fascinating world building and until the end, I didn’t know how The Pioneer would end. But in The Pioneer we as readers and we as humans, are forced to come to terms with our own existence – what does our existence change in the world around us. And what can we do with every decision that comes after. Find The Pioneer on Goodreads, Amazon, Indiebound & The Book Depository. This sounds really interesting. I am usually not a big sci-fi reader but with all of the awesome ones coming out I am eager to try more.